SpaceX has decided it would be easier to build its giant Starship spacecraft in Texas rather than at the Port of Los Angeles in California as originally planned, Alan Boyle reports. SpaceX says it’ll build and test the prototypes for its next-generation Starship space cruiser and Super Heavy booster in South Texas, despite a deal it struck to build a rocket factory at the Port of Los Angeles. At least by some accounts, the turnabout is a setback to Los Angeles’ efforts to build a high-tech “Silicon Harbor” at the port, with SpaceX’s planned 18-acre site on Terminal Island as the centerpiece. The Los Angeles City Council approved a 20-year lease agreement with billionaire CEO Elon Musk’s company in May. 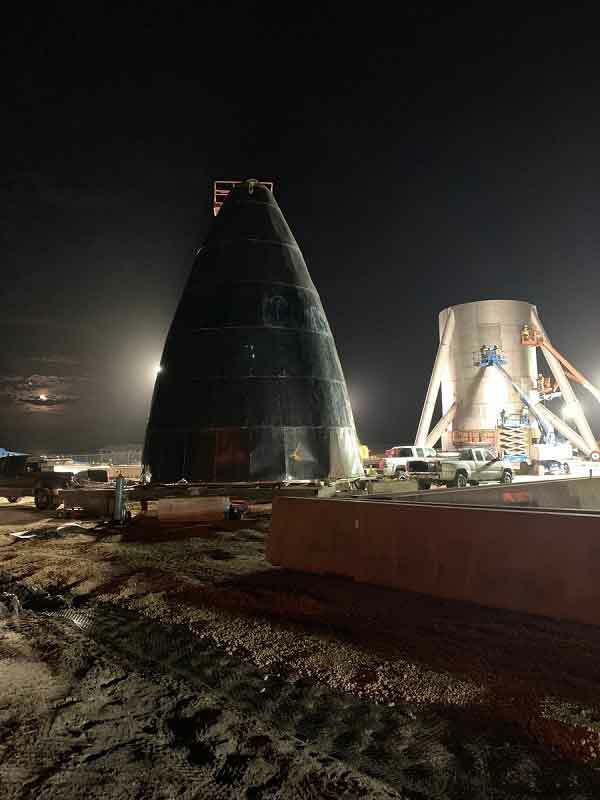 “We are building the Starship prototypes locally at our launch site in Texas, as their size makes them very difficult to transport,” Musk explained today in a tweet. SpaceX is building a launch site at Boca Chica Beach near Brownsville. It is assembling a subscale Starship hopper to conduct atmospheric tests later this year. Yes, it makes sense since the alternative is to ship it by barge thousands of via the Panama Canal. Add in the lower costs of doing business in Texas, including less government micromanage and he probably just cut his costs by a third. I expect R&D will follow once Falcon and Dragon starts winding down. I used to think there wasn’t much point in using a modified drilling platform as a launch/landing site, but it makes more and more sense to me as time goes on. Boca Chica, I think, is just too close to South Padre Island for routine SH-Starship ops to be going on just a few miles away. F9 or even FH, as originally planned for the site, would have been okay, but SH-Starship will, I think, prove too much. There is also the annual launch limitation at Boca Chica that, so far as I know, is still in force. SpaceX is limited to one launch a month due to the need to close the public beach during launch ops. A platform placed, say, 12 miles offshore wouldn’t have this sort of limitation and would also be in international waters for whatever that might be worth. Guests at any of the new hotels said to be in the planning now for South Padre Island would still have front-row seats for launch ops. The StarHopper, having only three engines, will be less of an acoustic problem for residents of South Padre Island than would even a Falcon 9. With the SH-Starship final assembly plant built on the current site, a set of ferry pads could be built from which SH and Starship units coming off the line could be “hopped” out to the actual launch platform(s) using partial propellant loads and only one or maybe three engines. In the event of really severe weather, the ships could be hopped back to land and securely tied down. Nice Pic, that’s a big rocket nozzle! Yes, the pressure waves from a launch of the Starship will be in the same range as a Saturn V. But there is no advantage in going into international waters, it will still be licensed by the FAA CST. Six to eight miles out will be enough. In terms of construction, that will probably be done at the port of Brownsville and the vehicles just transported by barge to be assembled at the launch site. I didn’t figure operating outside the 12-mile territorial water limit would exempt SpaceX from U.S. government regulation. Heck, Rocket Lab launches in New Zealand and still has to get licenses from the FCC and FAA because it’s an American-chartered corporation. But perhaps SpaceX could raise a bit of pin money by putting its launch platforms just outside the territorial limit and putting a casino on one of them. The South Padre Island spring breakers would love that. They are simply ASSEMBLING them in Tx. Not much skill required for this. All the parts will be manufactured in CA, where they can get decent skill. That’s not what the LA Times article says. Also, you wouldn’t get much savings on transport by making the components in CA and then shipping them to TX, as some of them are by design large even before assembled into the rocket. Sadly, the F-35 really shows the lack of skill in Tx. And CA still has loads of Aerospace. And SpaceX is not only NOT leaving CA, but actually forcing others to follow them there, in the sam fashion that Tesla has brought a number of car makers to CA. However, Colorado is picking up more and more of the skilled labor for doing more of this. Maybe Musk will build the Star Ship the same way. In the open vertical. Hydro-forming for the curved sections. Rolled sheet for straight. Vertical welding like SLS. Steel building that is vertical rather than their usual horizontal. No jigs. Let gravity keep it straight. Roll out and launch. All in one. Building, hanger, launch prep, refurb, maintence, load passengers. Wow! SpaceX should be able to pick up some suitable local hires too. ULA has – or had – a payload fairing plant just up I-69E from Brownsville in Harlingen, TX. There have been some job cuts there over the past couple years and, given ULA’s deal with RUAG last year to switch to all-composite payload fairings and to make them in Decatur, AL, the future of the Harlingen plant looks iffy. More than a few of these folks might welcome a chance to draw a SpaceX paycheck. The fairings made in Harlingen are/were, I believe, of sheet metal construction, not composite. So it seems there might be a fair number of locals in southeast TX with prior experience making large sheet metal parts to aerospace specs. Brownsville is also famous for its ship breakers who over the years have cut up everything from frigates to aircraft carriers. The same skills could be put to use building large structures. This Teslarati article has a great video showing the site. Don’t you like how the Moon is rising the background, in the clouds near the horizon. They are about as honest as Faux News/Breitbart. that part is true. If you have plenty of pollution, then Texas or CHina are the place to be. how far away is south padre island from the launch site? And would not a an old oil platform work? That is what a Jack-Up Rig is, a type of oil platform used in shallow water. And just what does the Civil War have to do with the expansion of the aerospace industry in Texas while in California it’s disappearing rapidly? You do known that the Stratolauncher may well be the last airplane built in California given that the C-17 production line shut down years ago. I personally do not care one way or another about California. As I have said over and over and over, Texas is NOT a good state for either Tesla OR SX to build in. You do not have the skill sets and Texas is one of the armpits of America. I lived there before. The place is horrible. Likewise, any of the blue collars that have decent skills leave there. And high-end engineers tend to be picky and will go to where the living is good. I would go to Penn, Mich, Indiana, Ohio, Wisc, but esp,. Minn.
Hmm, all high tax Union states, AKA the “Rust Belt”. All states that have driven their jobs to Texas. I understand now why you hate Texas so much and have to degrade it, like many in the Rust Belt you probably feel if Texas didn’t exist those blue collar jobs would have somehow stayed in the Rust Belt.